Grey Lady Too had lived in Ms Noble's semi-detached house for two winters before it was removed. A sheriff has upheld a council’s decision to remove a horse from a woman’s home in the Western Isles, ending a lengthy legal battle. Pensioner Stephanie Noble moved Grey Lady Too into her house on Lewis on Christmas Eve 2012 claiming there was nowhere suitable to keep her. Comhairle nan Eilean Siar subsequently seized the horse from the semi-detached property at Back in 2014, on welfare grounds. That prompted a courtroom battle after Ms Noble challenged the move. Sheriff David Sutherland has now upheld the actions of the local authority following a civil case at Stornoway Sheriff Court and has given an instruction that the horse can be sold. A spokesman for the Comhairle said: “From the outset, our concern in this matter has been the welfare of the animal and we welcome the court’s decision which validates the Comhairle’s position and actions. “We will take time to consider the details of the judgement carefully and await passage of the period for any appeal to be lodged. The horse has been kept at a sanctuary in Uist since its removal. Ms Noble had challenged the legal premise on which the action was taken as, she argued, it had been living in the house for two years without a problem and, she insisted, was well taken care of. The legal challenge was raised at Stornoway Sheriff Court in 2016 on the grounds that the council acted beyond the boundaries of animal welfare legislation. However, in a judgement passed by Sheriff Sutherland he rejected that position and ordered that the council be permitted to proceed with the sale of the animal. He also awarded legal costs to the local authority. The Western Isles Council said it had already spent around £10,000 on the horse’s upkeep since seizing it. In addition, it has run up thousands of pounds in legal bills. The council will now be able to sell the Connemara pony – or donate it to a charity. The council had said that under the Animal Health and Welfare (Scotland) Act 2006 it had the power to “take possession” of the pony if a vet said it is likely to suffer. 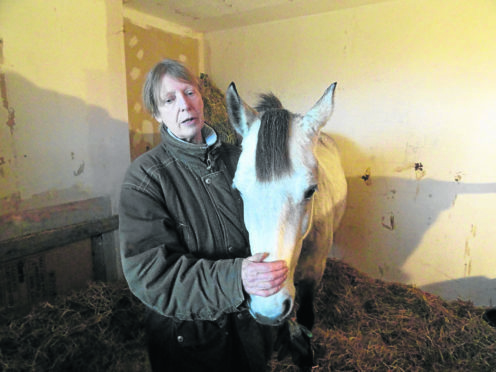 Twice divorced Ms Noble said she had no choice but to move her pony into her home after the animal was allegedly “dumped” on her lawn on a Christmas Eve following a dispute with the owner of the land where the filly had previously grazed. She bought the registered Connemara pony for £1,850 in September 2011. The qualified British Horse Society instructress and trainer had moved her furniture upstairs into her bedroom and said the filly was well-cared for downstairs.